Fitness is a way of life. I strive to provide my clients with the guidance, motivation and educational resources that will allow them to explore their own fitness potential and enhance the quality of their lives. I have been a fitness professional since 1993; I know how to design workout programs that are safe, fun, effective and efficient so that my clients stick to the program. I take my clients’ goals personally; in fact, I have not succeeded as their Personal Trainer until they have achieved their goals. 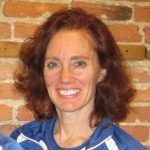 Karin’s strengths include cross-training clients for cardiovascular and muscular endurance, muscular strength, core stability and flexibility. She has worked with clients age 30-80 to improve their health and well-being.